Flowers are blooming and their scents fill the air. Branches are budding with the most vibrant green of the season. Spring has officially arrived! It is time to bring some of this fabulous season’s trademarks right into your very own home. Today I want to share with you how to incorporate this time of year in a very subtle way that will hopefully blend into your own personal decorating style. When I think of spring a few things come to mind. First and foremost, color is probably the most prominent trait of the season. Now, I am not talking about the pastels that tend to dominate the shopping color palate leading up to Easter. I am talking about oranges and how when they are placed in a decorative bowl they become more than fruit. Perhaps you prefer a tray topped with apples. Or maybe a clear vase filled with lemons is more your style. Have you noticed a theme here? The next time you are in the produce aisle at your local grocer, think about which fruits would make an inexpensive yet prominent impact on your spring decor style. I typically have a simple tray or bowl filled with some fresh fruit on display in our kitchen. Speaking of color, if spring were to be assigned a specific color, it could be none other than green. We live just north of The Woodlands, TX. This entire area essentially was built within a forest. What the north Houston area lacks in topography, it makes up for with the presence of the East Texas Piney Woods. When we decided to build this home, we specifically chose our lot based on the protected forest immediately adjacent to it. As Mother Nature wakes up from winter, she reveals hundreds of shades of green we don’t see at any other time of the year. 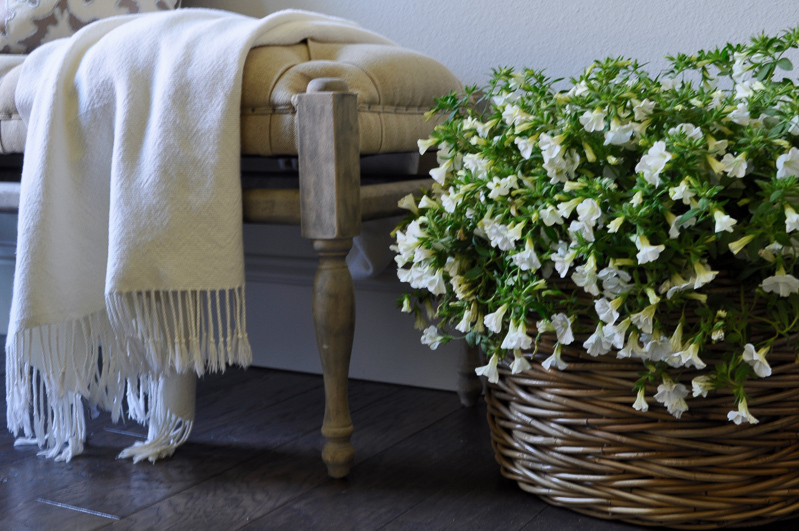 As you have seen, I love to bring life into my own home via plants and flowers. 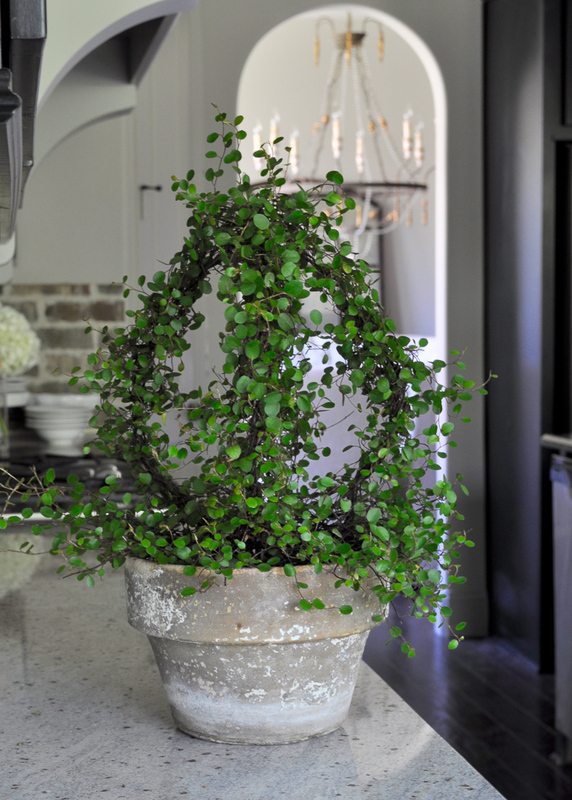 Whether a tree, a topiary, or a simple ivy, add something living to your home and welcome the outdoors inside. As mentioned above, spring signifies “new life” in a variety of ways. Beyond what we have discussed so far, nests and hatchlings come to mind as another sign that old man winter is behind us. Hallelujah! I don’t know about you all, but when I come across a bird’s nest, a sense of peace and wonder takes over. With merely a beak and clawed feet, birds of every size manage to create a safe, cozy home for their young. Twigs, leaves and various other elements will be recycled just as nature intended. 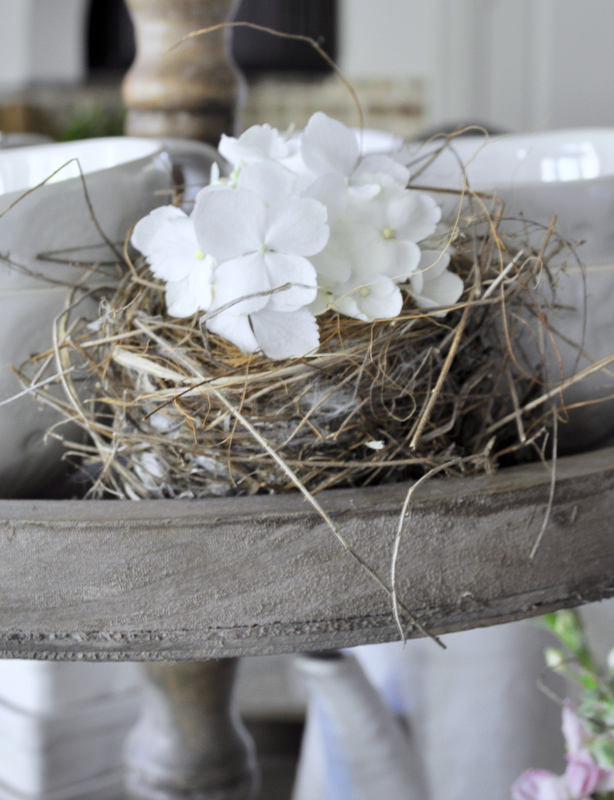 A nest displayed in your home can lend itself to function as a key piece of your spring decor. They can be displayed alone or they can be paired with items which fit nicely within their carefully and meticulously built walls. Let your creativity come to the forefront here just as the bird did when constructing their very own nest. Through fall and winter, we tend to utilize chunky throws made from thicker yarns as well as flannels. Spring signifies whites and lighter weight fabrics. Just as you would change out your winter wardrobe for your spring and summer clothing, the same should be done for your home. It is time to update those fabrics and accessories where fitting. 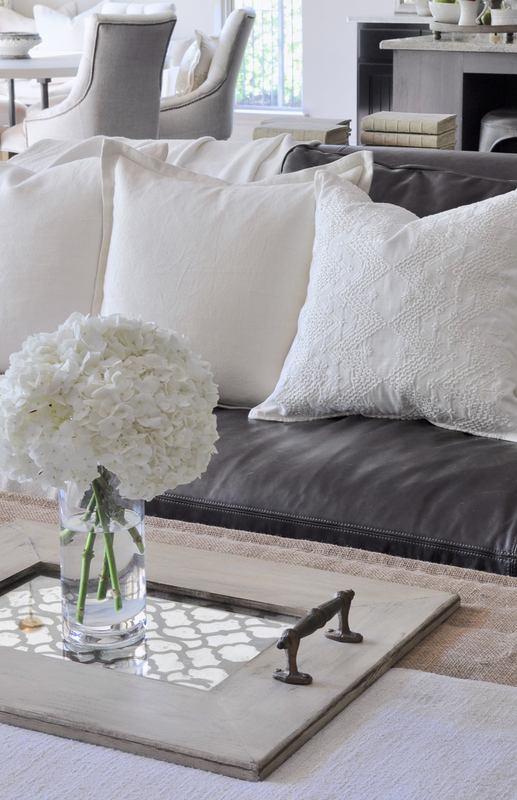 Lighten up your decor with brighter whites and linens. Your home and decorating style will appreciate shedding the additional holiday weight. Above, I mentioned a variety of tips and numerous ways to bring the spring season into your home. 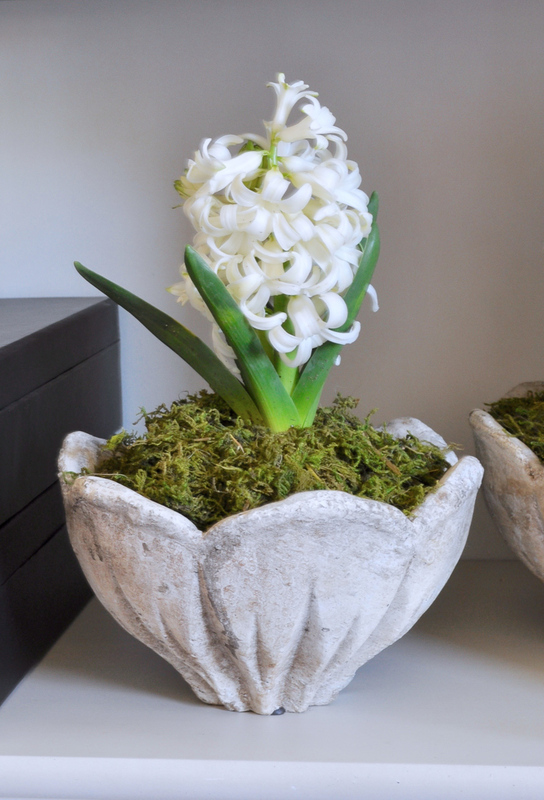 For some additional spring decor ideas, click here. Below, I would like to share some of my own creations which were inspired by the arrival of spring in our hometown. Please enjoy the tour! I love the architectural form a topiary provides. The aged pot is as special as the angel vine. 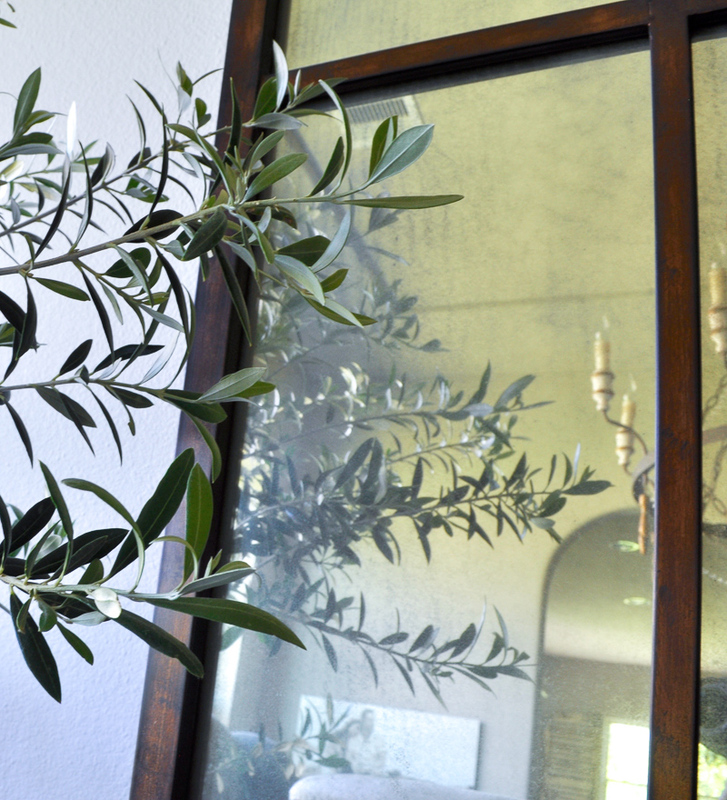 I added an olive tree to my dining room. What a find! A hyacinth adorns the shelf in my home office. I also added a flowering plant to a basket. I typically keep a plant like this inside a week or so before I plant it in my yard. 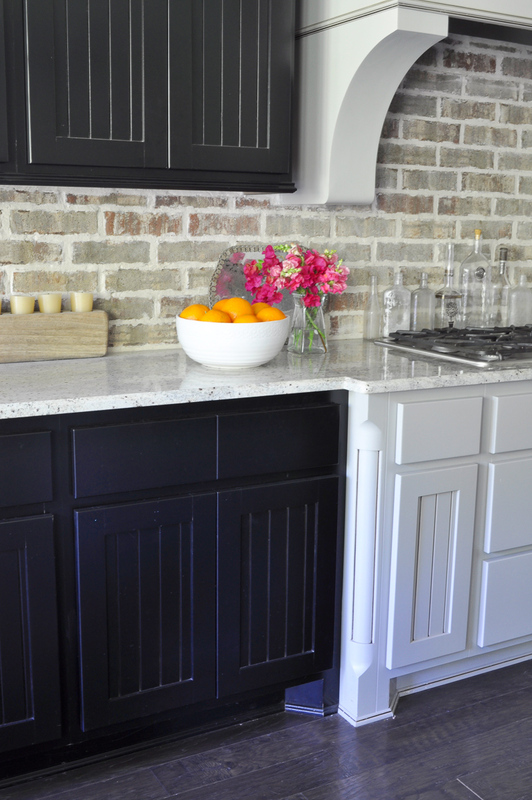 Back in the kitchen, oranges and bright flowers add a pop of color. The flowers are bougainvillea and snapdragons, both clipped from outside. 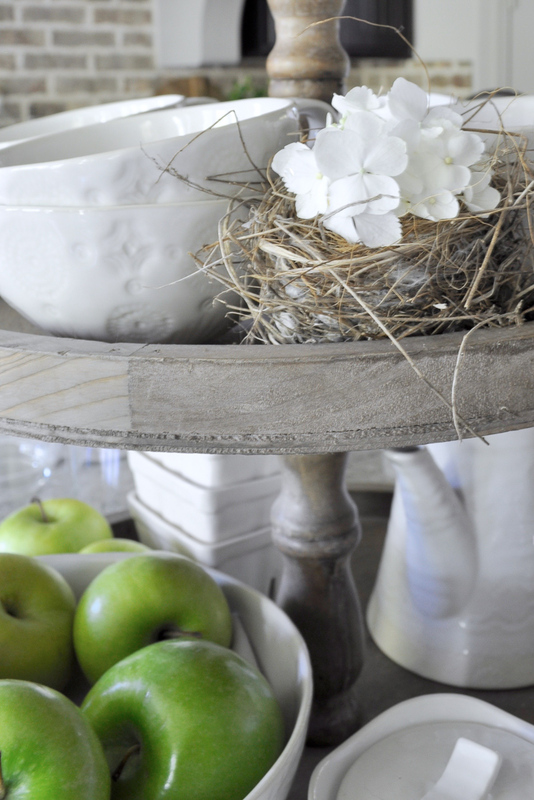 I styled my tiered tray with a nest, green apples, more clippings from my yard, and my brightest white pottery. 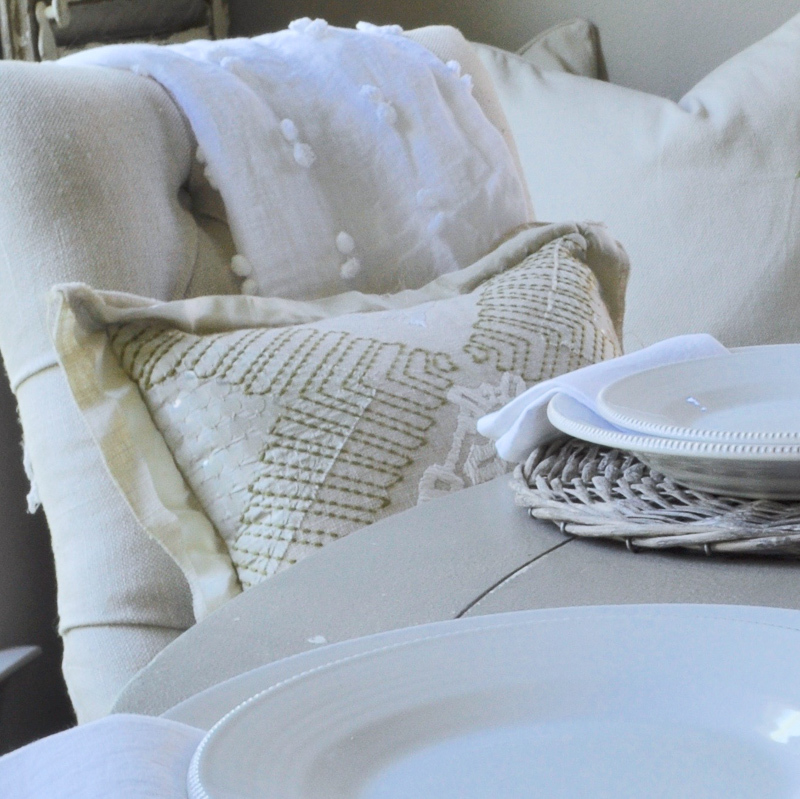 A lightweight throw and linen napkins are perfect for your spring table. 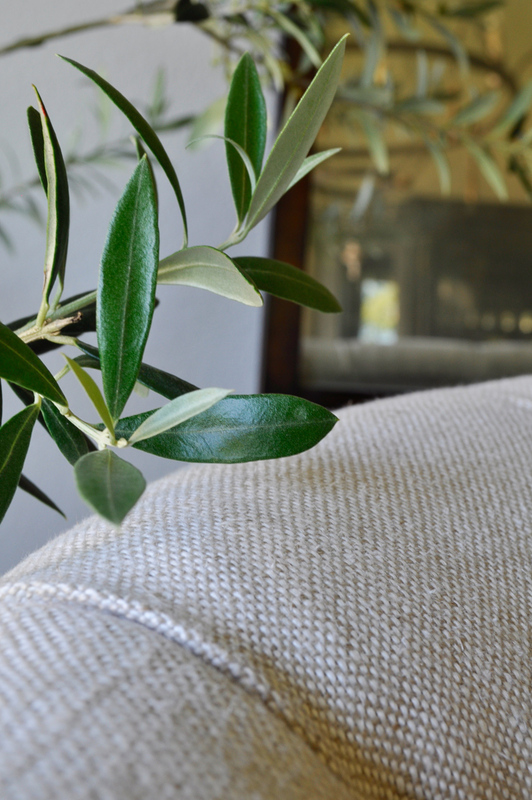 Brighter whites freshen up the sofa too. I’ll leave you with a closeup of a sweet bird’s nest I found under a tree last summer. I hope you found something simple to add to your own home for spring. Please find links to some of my favorite bloggers below! Jen, your spring touches are gorgeous! I love that you saved a bird’s nest and that try is styled impeccably! And, I totally need to start bringing my flowers inside before planting! I loved your tips Jen! Spot on! The nest with the hydrangeas is my favorite. Precious! Thanks so much Randi! It was in a tree in my yard. I used to see the bird who built it, but eventually she left and the nest blew out of the tree. Of course I scooped it right up! Love all the detail shots Jen…beautifully done! Thank you so much Janet! You are so kind to drop by! I love all the tips, but especially the fruit! Love the inexpensive pop of color that oranges, lemons, limes and green apples bring to a space… and they are items that everyone (no matter where you live) can get! Thank you sweet friend! 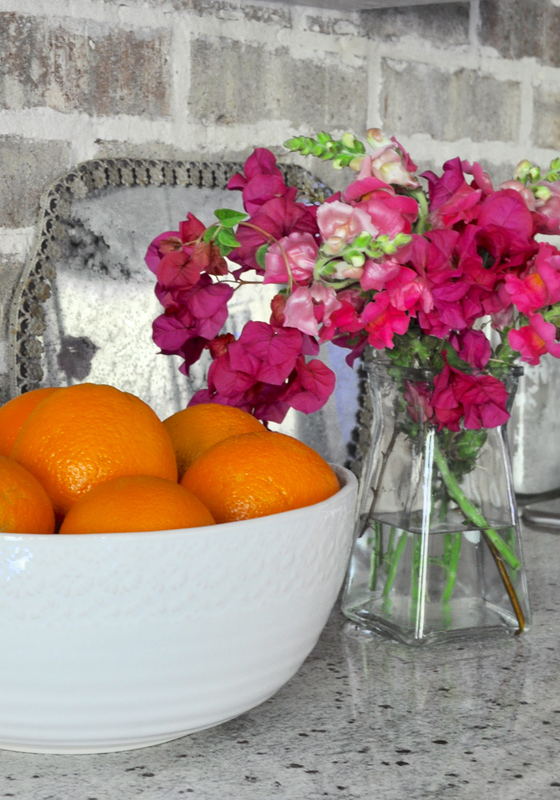 I’m right there with you…fruit is so gorgeous as a pop of color! I still adore that brick Jen! 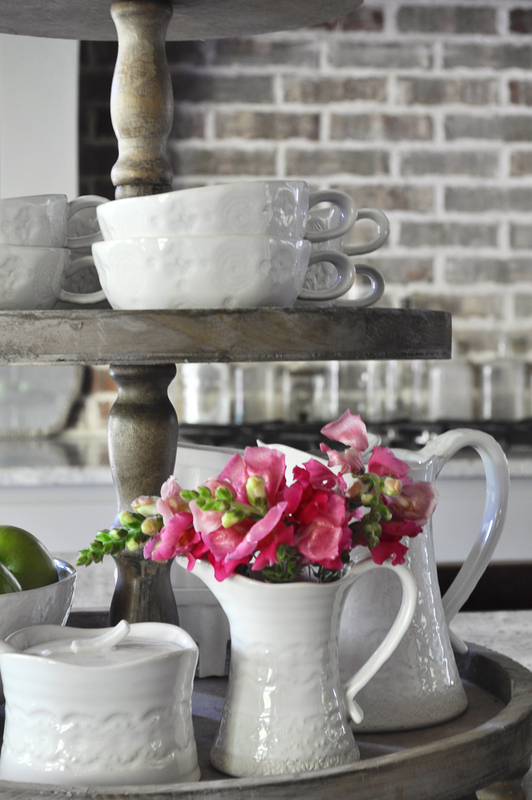 Loving all your spring touches and they go effortlessly with your beautiful home! Jen, so pretty! I’m loving all the greenery and fresh pops of color. 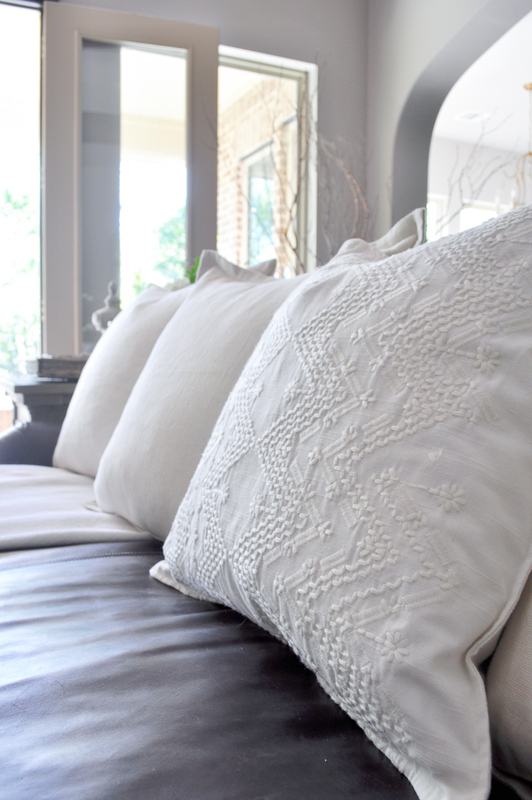 And those neutral pillows are stunning!! Happy Spring! Wow, Jen! There isn’t a thing you didn’t think of! Absolutely brilliant and so gorgeous! xoxo! 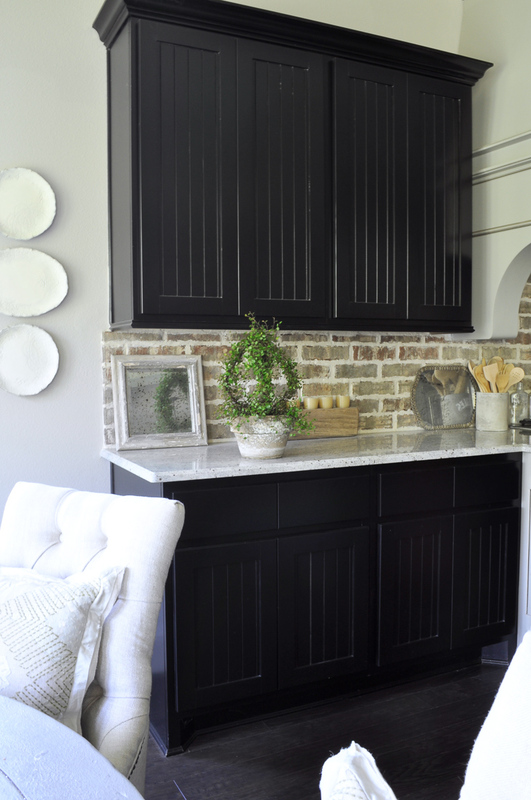 I love love love your brick back splash! Could you tell me where I could find it please? Thank you so much Stacy! It is an Acme brick, but the color has since been discontinued. You might still check with them. They may have replaced it with something similar. Beautiful Home!! I love everything about your style and decor. Would you mind sharing the paint color in your rooms? Is it a pale grey? Thank you Lynne! 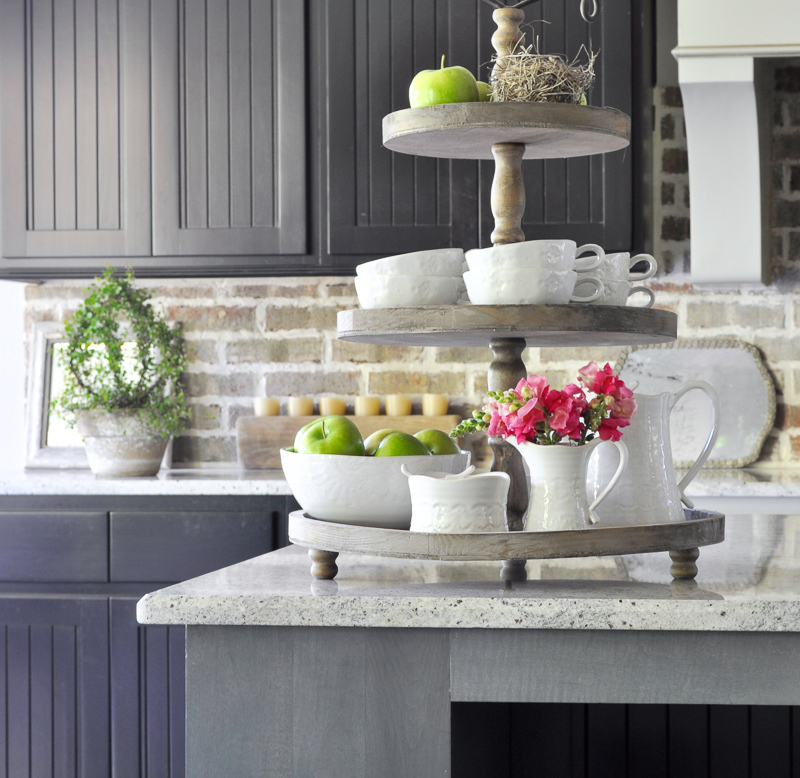 The paint is a light taupe, but the color is a custom blend.